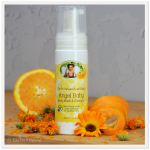 Gentle, versatile castile-based Angel Baby Body Wash & Shampoo smells amazing, naturally, with organic Vanilla and Sweet Orange essential oil. Made with soothing organic Calendula, Earth Mama’s safe, gentle and effective castile based body wash baby shampoo is naturally detergent-free, and perfect for a newborn's first bath, foamy fun baby bath time, hand washing and head-to-toe family clean. All of Earth Mama's castile-based Body Washes can be used to make DIY homemade baby wipes! Make your own safe, non-toxic Household Scrubby Cleanser! Mama wants you to know! 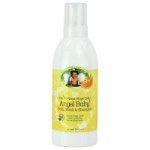 Natural castile soap is NOT a "no-tear" formula, please use with the self-foaming bottle so the wash stays just where you want it, and use extra care around your angel baby's eyes. Wanna know more about all the household cleaning products castile-based soap can replace? Click here!